Marlene Dietrich was one of the most enduring and iconic stars of the 20th century, re-inventing herself as a stage actress, silent movie actress, and then a movie star whose exotic persona made her one of the highest-paid screen performers of the 30s and ‘40s, before becoming singer who commanded the concert stage with ease in her later career. Having made her mark in Germany in her early career, she turned to Hollywood during the 1930s spurning lucrative offers by Germany’s Nazi government to return there and took US citizenship in 1937. All through her film career, she made notable musical contributions, and she built a legitimate career as a studio and ‘live’ singer, with a highly individual and recognisable vocal style to match her striking looks and image. This great-value 51-track 2-CD selects a representative range of her recordings, encompassing her film performances, commercial studio recordings (some of which were of her movie songs) and ‘live’ recordings, which combine to showcase the breadth of her talent and repertoire. It includes her duet recordings with Rosemary Clooney, which gave a her her only chart hit with “Too Old To Cut The Mustard”, selected tracks from her albums “Marlene Dietrich Overseas”, “Live at the Café de Paris”, “Live In Rio” and “Wiedersehen Mit Marlene” and from her collaboration with Burt Bacharach in the late ‘50s and early ‘60s which added another dimension to her oeuvre. 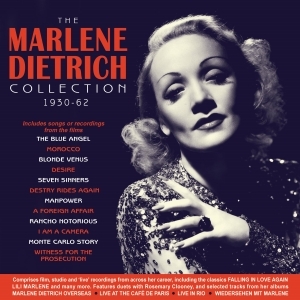 Includes songs or recordings from the films “The Blue Angel”, “Morocco”, “Blonde Venus”, “Desire”, “Seven Sinners”, “Destry Rides Again”, “Manpower”, “A Foreign Affair”, “Rancho Notorious”, “I Am A Camera”, “Monte Carlo Story”, “Witness For The Prosecution”. It’s a fascinating and enjoyable celebration of unique and distinctive star.